Whilst working slowly but steadily on a project on Japanese swordsmiths schools, I would like to use this opportunity to write something on one of these schools on which info is very rare and which are usually left out in most publications. This time I want to talk about the Yakuôji school (薬王寺) from Mikawa province, a province which was not a “big player” when it comes to famous kotô era swordsmiths but which gained fame as it was the birthplace of Tokugawa Ieyasu. Mikawa (三河・参河, also called “Sanshû”, 三州・参州) was what is today eastern Aichi Prefecture, was located along the Tôkaidô, and bordered on Owari, Mino, Shinano, and Tôtômi. 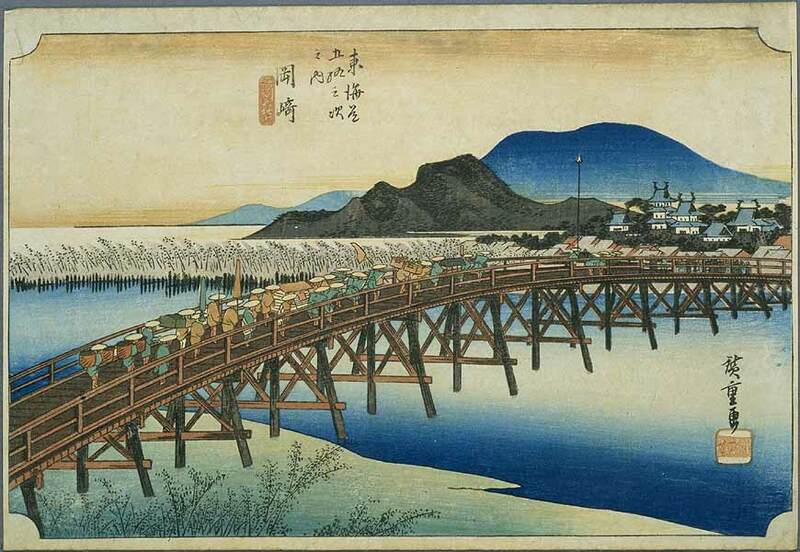 According to the records, the Yakuôji school was located in or around the town of Yahagi (矢作) in the provinces Hekikai district (碧海郡) (see picture 1). Before we continue I would like to point out that most of the information used for this article goes back to the studies of Kondô Hôji (近藤邦治) from the Gifu branch of the NBTHK, published in Tôken-Bijutsu 570 (July 2004). Also I would like to point out that I use “Yakuô-ji” for the temple, and “Yakuôji” without hyphen for the school. First of all, let´s take a look at the origins of the name of the school. “Yakuô-ji” means “Temple of Yakuô”, i.e. of the Bodhisattva Bhaishajya-rāja (jap. Yakuô-Bosatsu, 薬王菩薩), the Bodhisattva of medicine and healing. It is said that this name was used for the first time for a temple by the Nara-period Buddhist priest Gyôki (行基, 668-749). However, there are no pre-Heian records on Gyôki´s temple extant and the first document which mentions the existence of his Yakuô-ji is the Honchô-monzui (本朝文粋) which was compiled in the mid 11th century. About two hundred years later, to be more precise in Kemu two (建武, 1335), the temple was destroyed in the course of the fightings of Nitta Yoshisada (新田義貞, 1301-1338) and Kô no Moroyasu (高師泰, ?-1351) at the Battle of Yahagi River. A document preserved in the local Shinmei-jinja (神明神社) from Tenshô 15 (天正, 1584) says that what was left from the Yakuô-ji was used right after the fightings to construct the Renge-ji (蓮華寺) which is located just about 2 km to the northwest of Yahagi. So according to this document, the Yakuô-ji lived quasi on as Renge-ji. But the records of the Renge-ji tell us something else, namely that the Yakuô-ji was rebuilt to the south of temple ruins in Kyôroku two (享禄, 1529) and that this new temple was renamed “Renge-ji.” However, it is rather unlikely that the ruins were left to lie fallow for two hundred years and then “out of nothing” it was decided to erect the Renge-ji through which also the former Yakuô-ji lived on. Also there is a blade extant which is dated Bunki two (文亀, 1502) and signed “Sanshû Yakuôji” (三州薬王寺) (see picture 2). That means the already about thirty years before Kyôroku two there were Yakuôji smiths which used the name of the initial temple in their signatures. Incidentally, it is not uncommon for relocated or rebuilt and thus renamed Japanese temples that their former name or a local “nickname” was for centuries continuously in use aside from the new name of the temple. So far, so good, but what do the sword-related records say? From the Kotô-mei-zukushi taizen (古刀銘尽大全), the Honchô-kaji-kô (本朝鍛冶考), and the Kôsei kotô-meikan (校正古刀銘鑑) we gain basically two Yakuôji genealogies (see PDF below), namely one going back to Kaneharu (兼春) from neighboring Mino province who moved around Ôei (応永, 1394-1428) to Mikawa, and one going back to Nakahara Kunimori (中原国盛), who is said to be a descendant of Bizen Saburô Kunimune (備前三郎国宗) and who was active around Ôei too. The first smiths of these lineages who used the name “Yakuôji” in their signatures were the Eishô-era (永正, 1504-1521) Sadayoshi (貞吉), and the Shôchô-era (正長, 1428-1429) Suketsugu (助次), and this in turn is a further indication for the fact that the Yakuô-ji existed before Kyôroku two (1529) and that the erection or rebuilding of the Renge-ji did not mark the revival of the Yakuô-ji after two hundred years. 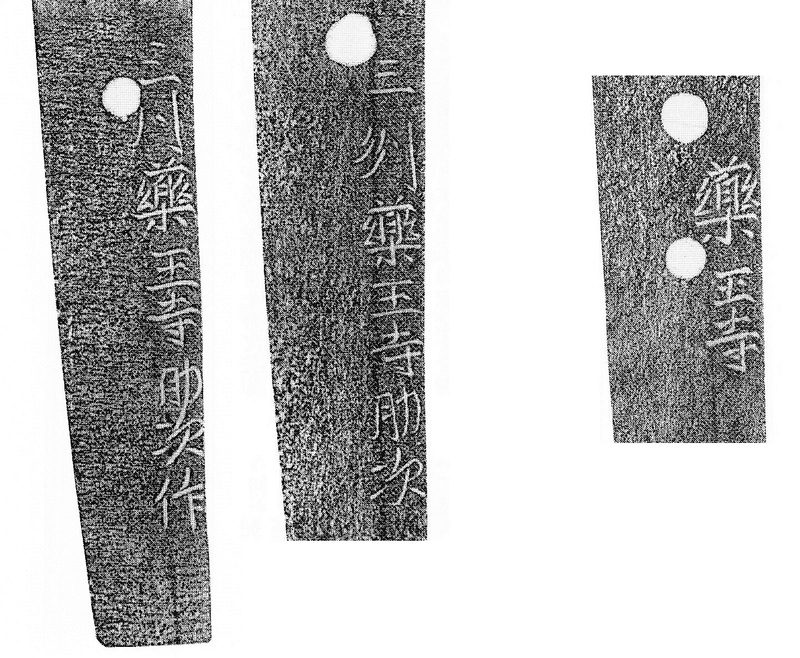 The earliest extant dated blade from the Mino-based lineage is from Kaneharu and from Bunshô two (文正, 1467), i.e. not from Ôei as the genealogies suggest. As for Nakahara Kunimori, there is the theory that his family name “Nakahara” goes back to Bizen Saburô Kunimune´s temporary stay in Nakahara in Mikawa province. Others say that “Nakahara” was already Kunimune´s family name and that he actually stayed in Yahagi when forging in Mikawa province because there was no place called “Nakahara” in old Mikawa province. Another interesting thing is that all the smiths after Kunimori had names of famous Yamashiro smiths, i.e. Awataguchi Kunitsuna, Kuniyoshi, Yoshimitsu, and Heianjô Yoshinori. Similarily, we find two more famous name, Sadayoshi who bears the name of Sa Sadayoshi (左貞吉), and Sanemori, who bears the name of the famous Ôhara Sanemori (大原真守) from Hôki province who supposedly signed with “Ohara” (小原). Incidentally, there is a town called “Obara” written with the same characters which is located upstream of Yahagi River but it is unclear if we are talking here about the same place (it is not uncommon that place names had different pronunciations, e.g. “Aoe” was also pronounced and quoted as “Aoi”). So there is the chance that we are facing here one of the pretty common “genealogy embellishments,” i.e. schools and smiths tried to “pimp” their genealogy by referring to famous ancestors. But there are several signed Yakuôji blades extant and it is hard to imagine that most of them are gimei to support genealogic claims. So as so often, the two presented genealogies give basic clues and have to be taken with a grain of salt, although it seems, from the basis of extant signed blades, that the Mino-based Kaneharu lineage is more sound. As mentioned, the sources point towards Ôei (応永, 1394-1428) as starting point of the Yakuôji school and we know that many of these smiths signed just with “Yakuôji”, that means without any individual smiths name. The most famous temple-affiliated swordsmiths where those of the Yamato Senju´in (千手院) and Taima (当麻) schools which also occasionally just signed with their school´s name which was also the name of the temple they were working for. It remains to be seen if the Yakuôji smiths belong to the same category of temple-affiliated swordsmiths (kônin-kaji, 候人鍛冶) as the Senju´in and Taima smiths. Also a religious background is possible as it was the case at the Gassan smiths (月山) who signed their swords with the name of the local holy mountain and used that name later even as family name. Well, at the beginning Muromachi period it was no longer common for temples to maintain swordsmiths but a religious background is not that off. We all know that long before praying for winning a battle or wealth for one´s family, people are first of all praying for recovery when they are ill and for health if they arent´t. As mentioned, Yakuô is the Bodhisattva of medicine and healing and so it is safe to assume that a temple where Yakuô is worshipped always has its followers, even if the temple was relocated and renamed. And a blade signed quasi “from the temple of the Bodhisattva of medicine and healing” has surely an auspicious connotation and goes well as a gift or lucky charm. Let us come back to the local history. In Muromachi times, Yagami was a station of the Tôkaidô but but when the Hideyoshi-retainer Tanaka Yoshimasa (田中吉政, 1548-1609) was granted with the lands in Tenshô 18 (天正, 1590), he enlarged the local Okazaki Castle (岡崎城) and made it his main stronghold. Also he had the Tôkaidô improved and thus slightly relocated so that it goes now through his newly erected Okazaki castle town, making it the new local station of the main route instead of Yagami. 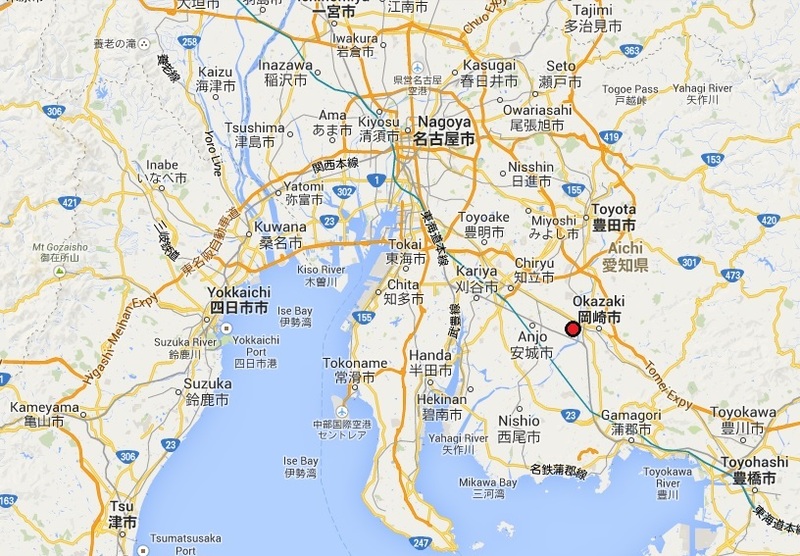 But the Yakuôji smiths were in that area long before that time, i.e. the booming new castle town can´t be used to explain the origin of the school. Also the school predates Ieyasu´s conquering of Mikawa province in the 1560s and the establishment of his Mikawa-bushi (三河武士), a group of loyal retainers from Mikawa. Apart from that we have anyway no records that these Mikawa-bushi and their men wore and ordered specifically locally made Yakuôji blades. With all that in mind, let´s see what we can learn on the origins and affiliation of the school from extant blades. There are works in nie-loaden gunome-chô with tobiyaki which suggest a connection to the Sue-Sôshû style. Many blades have their tangs finished with characteristic kata-sujikai yasurime, a feature which is peculiar to Mino-Senju´in smiths. Others in turn show Muramasa characteristics like a tanagobara-style nakago. The vast majority of the extant and individually signed Yakuôji blades go back to the Suketsugu smiths (助次) what makes some experts think that the school actually started with the 1st generation Suketsugu. And when we compare blades of the Suketsugu smiths which bear the prefix “Yakuôji” with blades which are just signed “Yakuôji”, we learn from the similarity in signature style (in particular the characters for “Yaku” and “ji”) that a certain amount of the latter go actually back to the hands of Suketsugu smiths (see picture 4). Anyway, most experts agree that the Yakuôji style is closest to the Sue-Seki style but interpretations in suguha-chô look more classy and show more Yamato characteristics. Another interesting hint for possible affiliations of the Yakuôji school can be found in the Kôzan-oshigata (光山押形), namely an oshigata of a blade signed “Yakuôji Ôtomo Sukeyoshi” (薬王寺大友助吉) (see picture 5). Incidentally, the last character for “yoshi” was obviously somewhat weak what resulted in the listing of smiths like Ôtomo Sukeshichi (大友助七) or Ôtomo Sukehito (助士, also quoted as “Sukenori,” “Sukekoto,” or “Suketada”). Ôtomo was a neighborhood of Yahagi and according to the Bunka (文化, 1804-1818) and Bunsei era (文政, 1818-1830) local history Mikawa-sôshi-roku Yahagi-sonki (参河聡視録矢矧村記) by Kamo Kyûsan (加茂久算), a certain Ôtomo group of armor and swordsmiths was active in the western part of Yahagi until about Tenshô (天正, 1573-1592) and Keichô (慶長, 1596-1615) whose helmets were called “Yahagi-bachi” (矢矧鉢). Please not that “Yahagi” (矢作) is quoted in that reference with the characters (矢矧). So when we use the aforementioned oshigata of the Kôzan-oshigata as piece of evidence, than everything points towards that the Ôtomo smiths were a branch of the Yakuôji school. Picture 5: From the Kôzan-oshigata. Kondô now speculates in his article that the Ôtomo formed a major part of the Yakuôji school and that they used the Yakuô-ji or a fictitious (or bribed) monk in the temple´s administration as a way to sell sword blades at the side. The smiths´ guild had on the one hand certain privileges and also the permission to offer their works on the free market but on the other hand, they were strictly regulated and monitored so that they did not sell products at the side for which they did not have the license. But if this is true, it must had happened parallel to the actual swordsmiths like the Suketsugu family which fully signed their works and made them thus instantly retraceable. Well, Kondô brings into play the Nagasone school (長曽祢) of armorers which also made tsuba, harness, locks, small bells, or nails at the side and even signed them. But I guess they either had the permission to do so, or their sidelines were overlooked and tolerated as no swords, i.e. weapons were made. And in my opinion, we must not overlook the quality factor. All the Yakuôji blades presented by Kondô in his article are pretty high-quality or at least of decent quality. That means it needed a considerable amount of training and practice, even for an armorer, to turn out sword blades in that quality. So there must had been quite a “hidden enterprise” behind that business model just to sell sword blades at the side. But with the demand for swords throughout the Muromachi period we must bear in mind that the sword business was probably very lucrative. So if you were a (black)smith back then, temptation was surely great to make and sell sword blades at the side. I have a tantō attributed to this school. Let me know if you want to see pictures.